Lordy lordy I have one epic recipe for you today! It is the second in my current collaboration with Castello and utilises their absolutely outrageous Castello Double Cream Truffle Brie and involves salty pancetta, sweet onion, earthy mushrooms, soft pillowy gnocchi, and a crumbling of walnuts…but seriously the thing that makes it so decadent is the cheese that melts throughout and on top…you’ll be fighting over who gets to dig into the ‘prime spot’ when serving. It makes a perfect dinner for four to serve over the Easter break, all you need alongside is a bitter green salad or some just-cooked green beans. And frankly it will be on my go-to list this winter…I may just be spending it watching Netflix with mates, but hey at least dinner will look like it could be eaten in a snowy log cabin in front of a roaring fire! You don’t need any more excuse to try it for yourself, but I also have two $40 Castello vouchers to GIVE AWAY – all you need to do is to leave a comment below, and I will draw the two lucky winners on Friday 12th April. What more is there to share with you!? Heaps as it happens – my house sale, and the one I have bought will be confirmed unconditional tomorrow – wooooo hoooooo!!!! I am so excited – move in date for me will be the third week in May, so there is much to get done before then, and I absolutely can’t wait. I also just got back from the fabulous Upsurge Festival in the Bay of Island, where I was lucky enough to be the speaker for a gorgeous bunch of festival goers on Friday. I was joined by a hilarious friend from Australia, so it turned into a super-fun little roadie. Meanwhile Hoob will be in Auckland for a few days at the end of next week as he accompanies the Wellington uni basketball team that he coaches (hurrah) and a few weeks later Pog will also be up for a few days post Easter (more hurrah)! I miss my lovelies every day as always so will be hanging out to seem them. Right – that’s enough from me – I really hope you give this gnocchi dish a try, it is outrageously good! Preheat the oven to 190˚C. Heat the olive oil and butter in a large frying pan and cook the pancetta for 5 minutes until crispy and golden. Scoop out of the pan and set aside. Add the onion to the fat remaining in the pan and cook over a gentle heat for 10 minutes. Remove and add to the pancetta. If necessary add 1 more teaspoon of olive oil and cook the mushrooms over a medium/high heat for 10 minutes, stirring occasionally to stop them from catching. While they’re cooking bring a large pot of water to boil. Add the pancetta and onions to the mushrooms with the wine and cream and cook together for 5 minutes. While they’re cooking, cook the gnocchi according to the packet instructions then drain well. 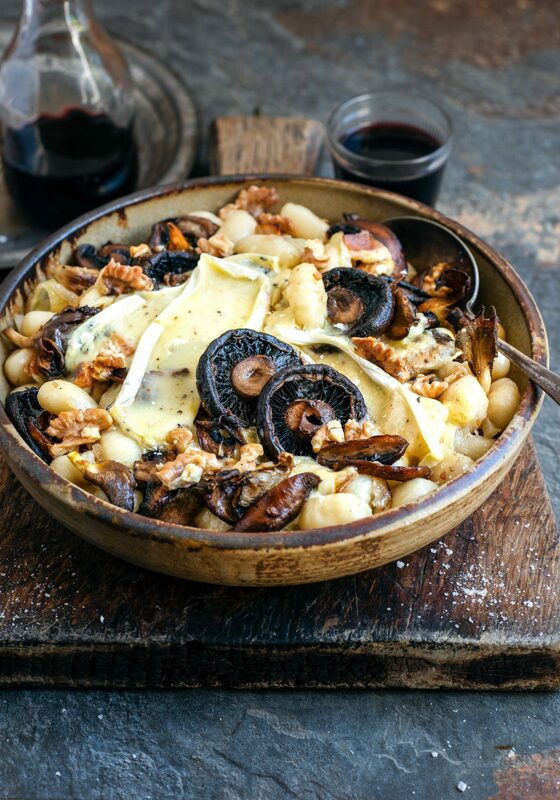 Add the gnocchi to the mushrooms with half of the Castello Double Cream Truffle Brie and stir to combine. Spoon into an oven proof dish and top with the remaining brie and the walnuts. Finish in the oven for 5 minutes before serving with a simple bitter green salad or freshly cooked green beans. Huge congratulations on your house sale and purchase, Sarah – from experience, it can be a harrowing time! So much to look forward to now! Hi Sarah good luck with your huge purchase! That cheese is hubbys favourite 😊A taste of Italy! This sounds delicious and easy – gunna give it a try tonight. This looks amazing. Perfect food for a cold Dunedin evening. Adding ingredients to my shopping list as I type! wow this is a stunner Sarah – definitely on the to-do list for dinner one chilly winter night. What an absolutely delicious recipe – can’t wait to make it! Best wishes for your new house. Looking forward to trying this epic recipe! Might be a bit insane but thinking of making my own gnocchi to go with – any recipe suggestions Sarah? Oh goodness! I feel like I’m falling into a dream – this dish has all my fave things – especially that Castillo truffle Brie which has made a repeat appearance on our picky platters this summer – can’t wait to give this one a try!! Holy guacamole that recipe sounds insane!!! Definitely a good one for Easter. I wonder if wild mushrooms picked at Lake Alexandrina would work? This looks delicious! I’m going to make this for Family Easter brunch! This looks incredible!! Absolutely going to give it a try…and like Claire, I think I might try making my own gnocchi too! This looks incredible! If I didn’t already have a crockpot of bacon hock and vegetable soup bubbling away to counteract Welly’s miserable weather, this would be on its way to my belly right now… Can’t wait to make it next weekend! What brand if gnocchi do you recommend if not git time to make from scrstch? This looks so luxuriously comforting. Didn’t know Castello did a Truffle Brie, now I know, I can’t wait to try!! Wow.. I just about fainted with giddiness when I saw this recipe. I am going to make this over Easter with some parsnip gnocchi and a rocket salad with a drizzle of truffle oils and pear slices.. now to decide the wine match. Roll on Easter!!! Amazing looking comfort food for winter Sarah – yum! As a blue Castello addict your recipes have encouraged me to try their other options – the double cream Brie is insanely good! All the best for the house move…so exciting to find a new place to make your own. 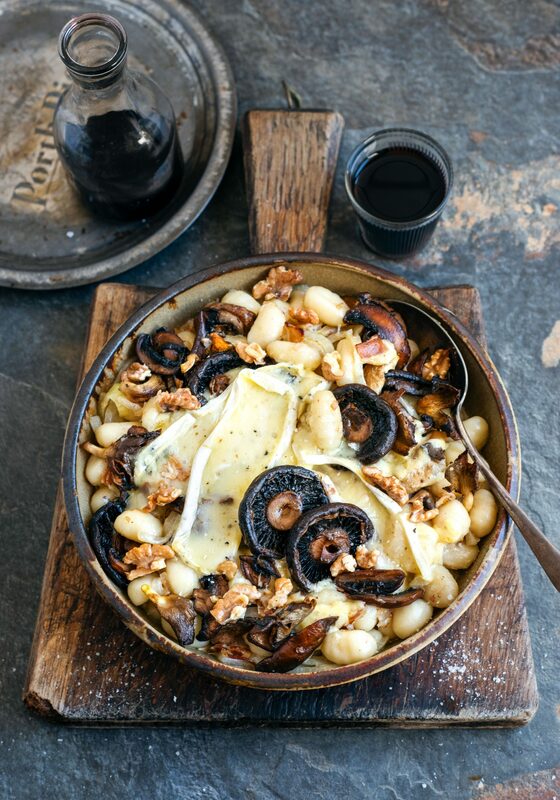 This is like all my favourite foods wrapped up in one pan – cheese, truffle, mushrooms, pasta! Looks divine and am definitely making this over Easter for my extended whanau! Happy days! You had me at TRUFFLE! That truffle castello is an absolute must with my work wives at our cheese nights. This looks sooooo delicious! Would love to win the cheese and give the recipe a whirl. Absolutely stunning. A meal of outright favourites. Roll on Thursday lunch. Let’s hope our guests enjoy it. Woo hoo. This looks outrageously good! Will definitely be testing this out over Easter for the family! All my favourites in one yummy plateful!!! The truffle brie has been on my Sunday platter for some time now, it is amazing! ‘Grats on the sale / purchase – exciting times! Have enjoyed Castello cheese in the past but would love to try with truffle. Will have to get some on the next trip to gather the shopping. Lovely recipe which would wow the diners at Easter. Thankyou! !